A study was conducted during the 1996–97 crop growth season at ICARDA in northern Syria, to investigate the influence of wheat canopy architecture on the partitioning of moisture between soil evaporation and crop transpiration, on a soil with high hydraulic conductivity. The study was conducted on the long-term two course wheat-lentil rotation trial, established on a swelling clay soil (Calcixerollic xerochrept). The wheat canopy architecture was manipulated by sowing the crop at either of two row-spacings, 0.17 or 0.30 m, both at a constant sowing rate equivalent to 120 kg ha−1. 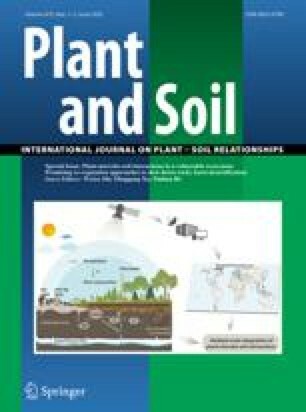 In this study, evapotranspiration from the crop was inferred from changes in soil moisture content over time, evaporation and rainfall interception were measured daily using microlysimetry, drainage was estimated as being the difference between potential daily evapotranspiration, and the evapotranspiration estimated from the soil water deficit. Between sowing and day 80 (tillering stage), evapotranspiration was calculated to consist mainly of soil evaporation. However, after day 80, transpiration became an increasingly dominant component of evapotranspiration. For both row-spacings, cumulative evapotranspiration over the season was approximately 373 mm. In the narrow-row crop, transpiration and soil evaporation were approximately 185 mm and 183 mm of water respectively. Conversely for the wide row-spaced crop, 172 mm of water was transpired while about 205 mm of water evaporated from the soil surface. While green leaf area index did not differ between row-spacings, the architecture of the crops as a result of sowing affected solar radiation penetration such that more incident radiation was intercepted at the soil surface of the wide row-spaced crop. This is likely to have made some contribution to the elevated levels of evaporation from the soil beneath the canopy of the wide-sown crop.